Nov 17, 2015 – TORRANCE, Calif.
Sporty and spacious, interior space grows by 8.4 cubic feet and rear-seat legroom is up more than 5 inches. The newest member of the completely reengineered and reimagined 10th-generation Civic lineup – the 2016 Civic Coupe – will make its first public appearance at the 2015 Los Angeles Auto Show. 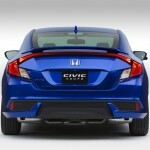 Launching in March, the 2016 Civic Coupe delivers an even sportier and emotional take on the new Civic design while benefitting from the multitude of upgrades to the 10th-generation Civic lineup, including a sophisticated and sporty new chassis, a more spacious and quieter cabin, class-leading fuel-economy ratings and targeted top-in-class crash safety ratings. 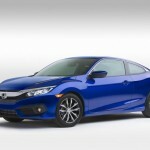 The new 2016 Civic Coupe, like its sedan counterpart, will feature two advanced new engines, including the first-ever turbo engine for the Coupe, delivering more power, performance and fuel efficiency. All new Civic Coupes, from the well-equipped LX to the new, line-topping Touring trim, also receive significant upgrades to interior style, with soft-touch materials and high-grade finishes, along with a bevy of new standard and available features, including the Honda Sensing™ suite of safety and driver-assistive technologies as well as both Apple CarPlay® and Android Auto™. 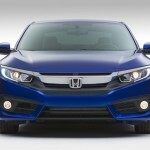 The 2016 Civic Coupe is the second in a series of new 10th-generation Civic models that Honda is launching over the course of the next 18 months, including the Civic Sedan, Civic Coupe, the first-ever Civic 5-door hatchback for the U.S. market, Civic Si performance variants and for the first time in the U.S., the radical new Civic Type-R. 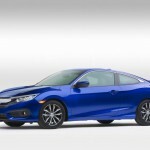 The 2016 Civic Coupe carries forward the sporty and premium character of the 10th-generation Civic design, including the bold front fascia, fast-back profile and sharp-edged detailing, as well as its more athletic wheels out proportions – its longer wheelbase (+2.9 inches), wider body (+1.9 inches), shortened front overhang (-1.4 inches) and wider stance. 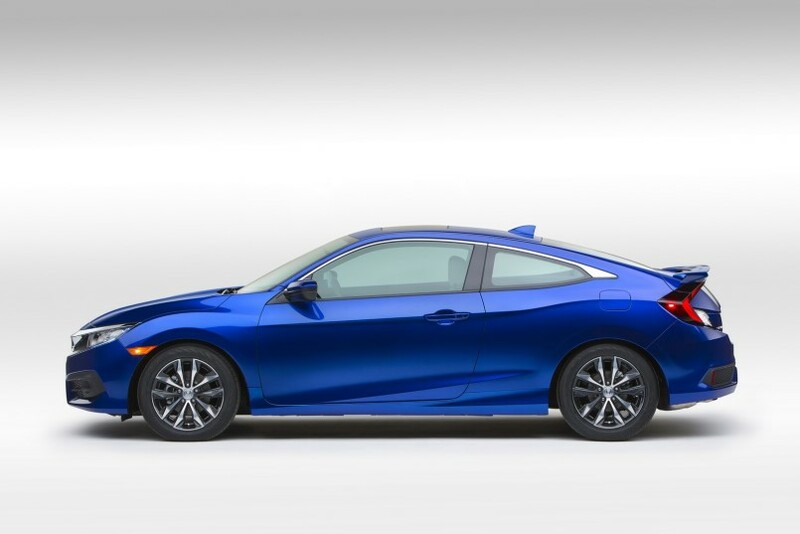 The new Coupe also benefits from the lower seating position, or hip point, of the new Civic platform, which amplifies the Coupe’s low, wide and planted dynamic driving character. From the A-pillars rearward, the Coupe features unique exterior styling with a lower and more steeply raked roofline, nearly 1 inch lower than the Sedan, and more compact proportions, with the rear overhang and overall length shortened by 5.5 inches. 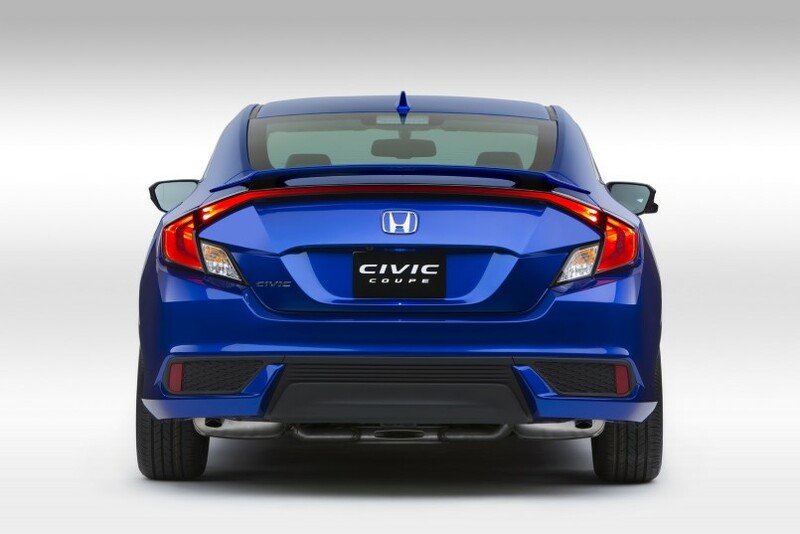 The new Coupe also features an exclusive rear taillight design that carries the arch of the distinctive C-shaped LED taillights across the full length of the rear deck lid. 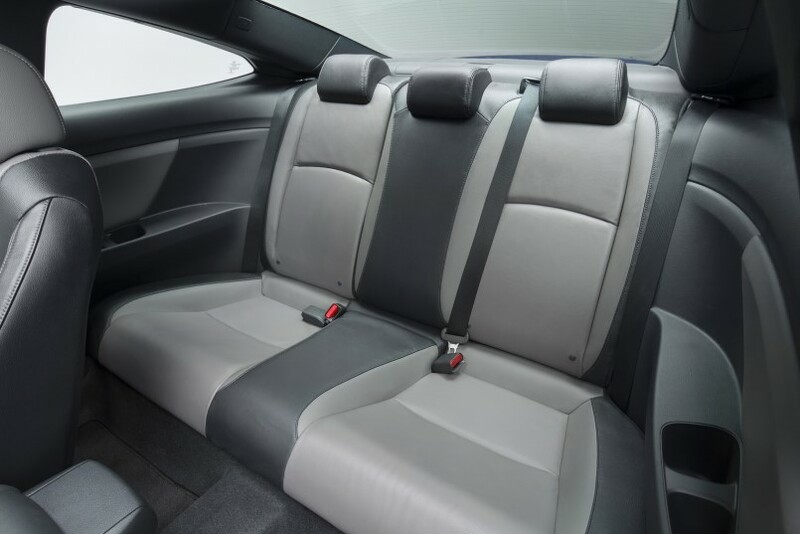 The 2016 Civic Coupe’s sportier design does not come at the expense of passenger comfort, as interior space grows by 8.4 cubic feet and rear seat legroom is increased by more than 5 inches, compared to the outgoing Coupe model. 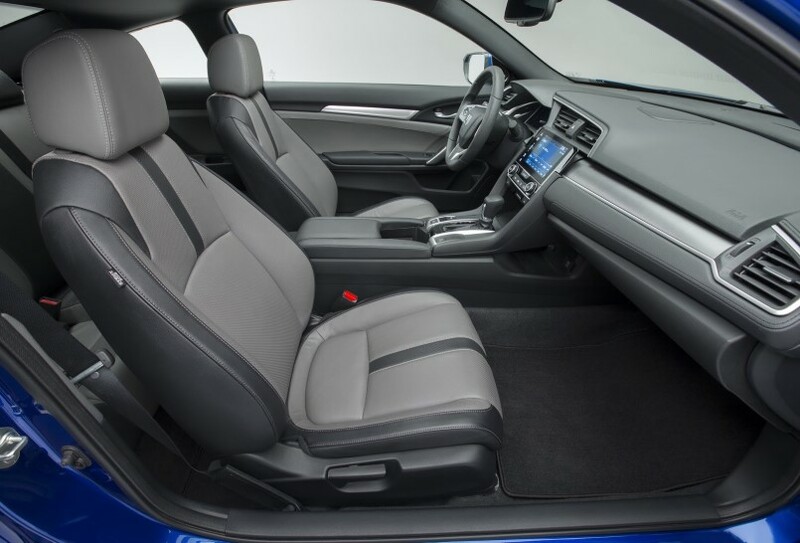 The new Civic Coupe interior strikes a more premium tone with high-quality materials and high-contrast finishes. These include a new one-piece, soft-touch instrument panel with molded stitching; more premium seat fabrics; a new full-color TFT center meter (EX and above trims); door inserts with real stitching; an LED shift indicator and LED overhead lighting; and for EX and higher trims, a leather shift lever boot. 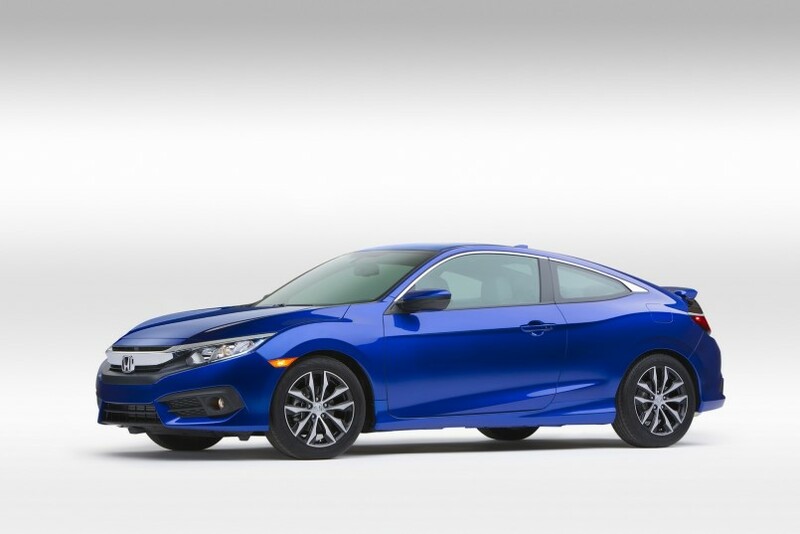 All new Civic Coupes, from the well-equipped LX to the new line-topping Touring, feature upgraded interiors and an expanded list of standard and available technologies and features. New standard equipment includes auto on/off headlights, LED daytime running lights, LED taillights, acoustic glass windshield, automatic climate control (dual-zone in upper trims), Electric Parking Brake with Brake Hold and Walk-Away auto door locks. 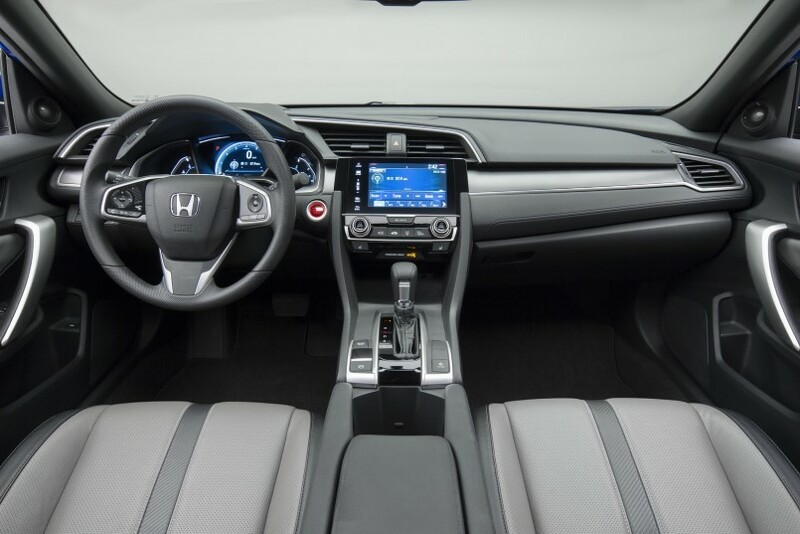 New available features include Honda LED headlights, Remote engine start, heated front seats and side mirrors, rain-sensing wipers, full-color TFT center meter and seven-inch Display Audio touchscreen. The new Civic Coupe delivers the latest in audio and connected-car technology, including more powerful audio systems; an available new Android OS-based, 7-inch Display Audio touch screen interface; a bevy of streaming audio options such as Pandora®, SiriusXM® and HD Radio™; and for trims with Display Audio, full compatibility with both Android Auto™ and Apple CarPlay® platforms. 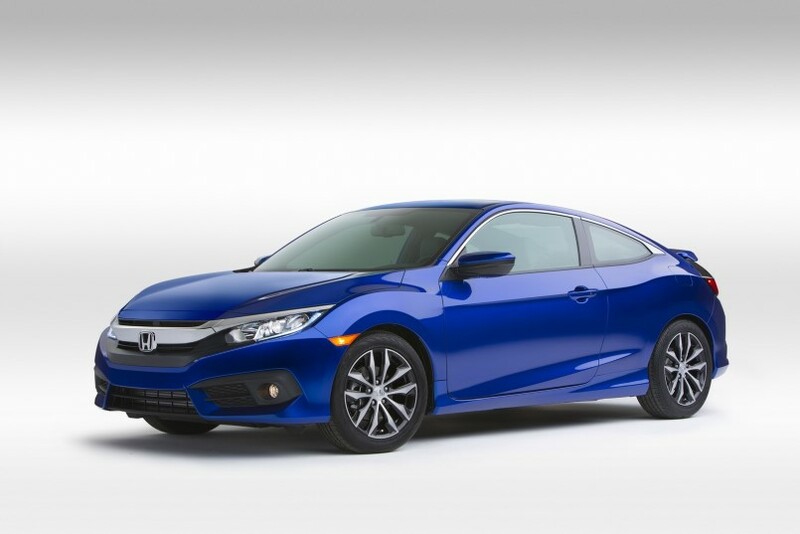 The Civic Coupe highest trims will also feature a new Honda Satellite-Linked Navigation System™ developed in cooperation with the experts at Garmin. 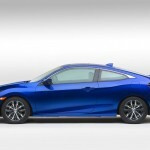 The 2016 Civic Coupe will launch with two more powerful and fuel-efficient powertrains, Lower trims receive a new 2.0-liter DOHC i-VTEC™ engine turning out 158 horsepower and 138 lb.-ft. of torque1 (+15 HP and +9 lb.-ft. vs. 2015 Civic 1.8L) with anticipated EPA fuel-economy ratings of 31/41/35 mpg2 (city/highway/combined) for models equipped with CVT. This engine can also be equipped with a 6-speed manual transmission on the lowest trim. 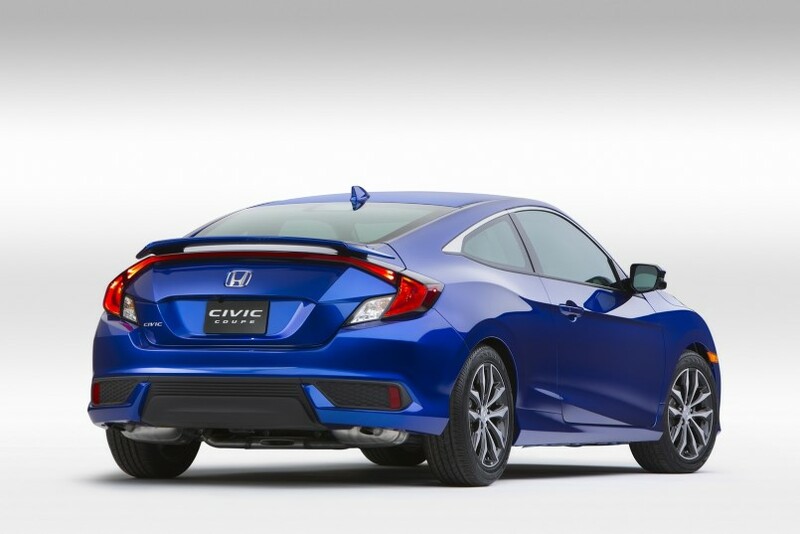 Civic Coupe mid to highest trims are powered by a new 1.5-liter DOHC direct-injected TURBO – the first-ever turbocharged engine for Civic Coupe – putting out a peak 174 horsepower and 162 lb.-ft. of torque3 (+31 HP and +33 lb.-ft. vs. 2015 Civic 1.8L) with anticipated EPA ratings of 31/42/35 mpg2. 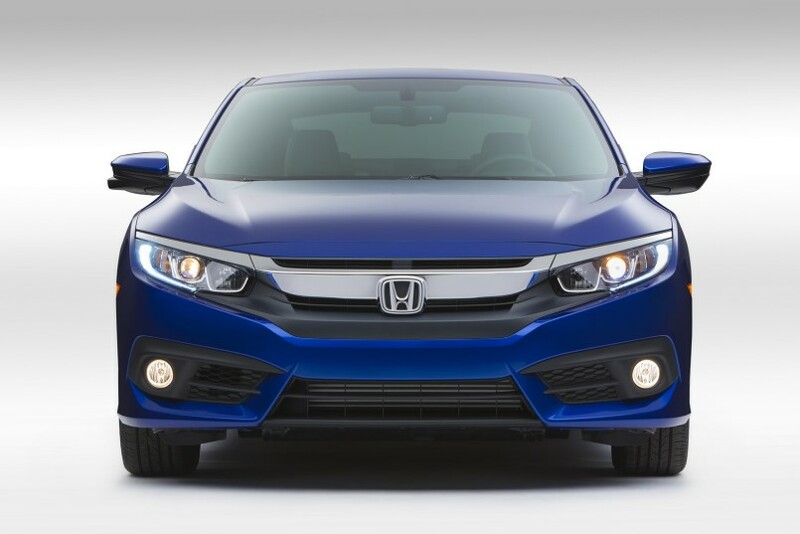 The 2016 Civic Coupe utilizes Honda’s next generation Advanced Compatibility Body Structure™ (ACE™) working in conjunction with advanced airbags and seatbelts to provide a high degree of safety performance. 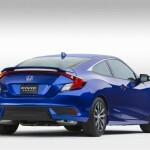 Utilizing these systems in conjunction with the available new Honda Sensing™ suite of advanced safety and driver-assistive technologies, the 2016 Civic Coupe with Honda Sensing™ targets the highest available U.S. safety ratings – an NCAP 5-Star Overall Vehicle Score from the National Highway Traffic Safety Administration (NHTSA) and a TOP SAFETY PICK+ rating from the Insurance Institute for Highway Safety (IIHS). Honda offers a complete lineup of Honda cars, trucks and service with a network of more than 1,000 Honda dealerships within the United States. Eight Honda auto plants in North America, including four in the U.S., have the capacity to produce 1.92 million automobiles each year. In 2014, more than 97 percent of the Honda and Acura automobiles sold in the U.S. were produced in North America using domestic and globally sourced parts. 1Peak power: 158 HP @ 6000 rpm (SAE net), peak torque: 138 ft-lb @ 4200 rpm (SAE net). 2Based on internal testing; 2016 EPA mileage ratings not available at time of publishing. Use for comparison purposes only. Your mileage will vary depending on how you drive and maintain your vehicle, driving conditions and other factors. It looks nice, but I’m not sure about the functionality of the sloping hatchback. I prefer the hatchbacks of the mid-90s Civics. This is more like the Integra or RSX.